Among all the components that affect casting, the Thrust is perhaps the most important one. It is this component that creates Energy, direction and precision. 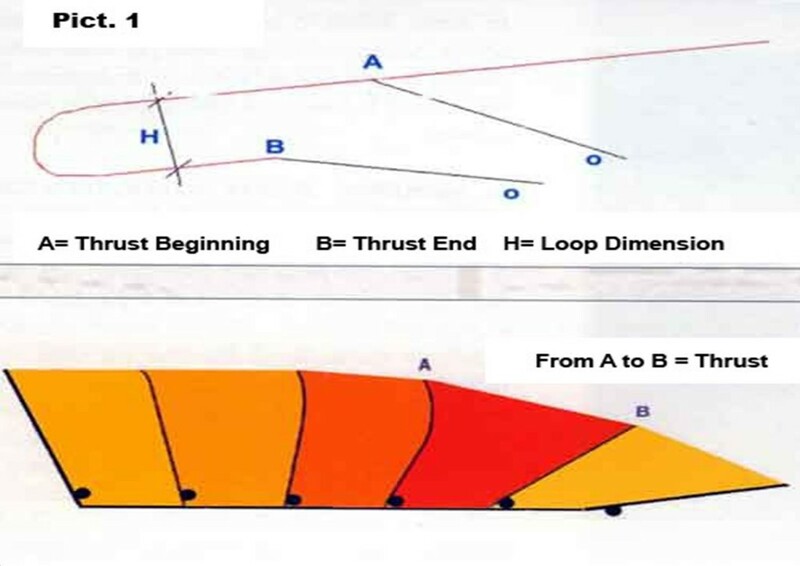 The Thrust can be defined as: “the precise instant during which the rod transmits a sudden increase in velocity to the line in a very defined space. The line goes forward over the rod tip and the loop is formed”. In any cast, there are two Thrusts – a forward one and a backward one respectively in the forward cast and in the back casts. Before the Thrust, the line speed must increase constantly and progressively. As a practical example let’s consider the rod which at the beginning has velocity equal to zero. This velocity must increase gradually to say 100 until a fraction of an instant before the thrust. Increasing gradually in tens that is from 0 to 10, then to 20, 30, 40 etc, until 100. At this point the line must past over the rod tip. In this precise moment the line speed must increase suddenly and in a very short space. In this way, the rod tip, which until now was just dragging the line, will create a sudden snap and a forward increase in velocity thus creating the loop in front of the rod tip. This exact moment can be identified as the Thrust. 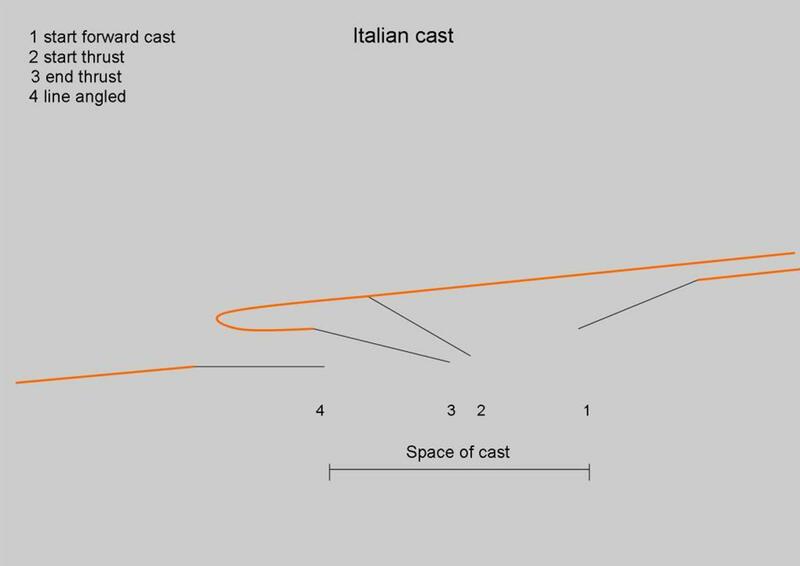 In the Italian style of casting, the Thrust is the second last stage of the casting procedure and we will analyze this concept in detail further on. In fact, in this technique there are no stops as in other classical casting styles and thus the Thrust can be identified as the final acceleration which is produced in a shorter and more concentrated space and is generated during a very short period when compared to the whole trajectory of the rod during the entire casting process. 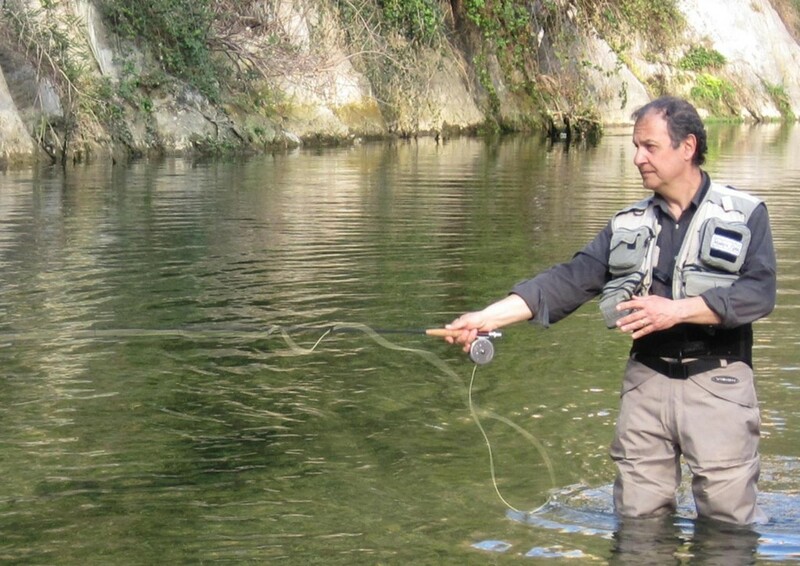 This brings you to execute the cast as low down as possible, that is with the rod almost horizontal to the water. This inevitably leads to a very tight loop. a) The Thrust must never be the last component of the casting procedure but the second last one. There must be no stop between the Thrust and the vibration dampening process which is the final action. b) It must be preceded by a constant acceleration of the line. c) Just before the Thrust, the rod must be almost unloaded, that is – it should just pull the line. It must then pass over the tip of the rod and form the loop only in the instant the Thrust takes place. d) The Thrust should be executed as low down as possible, that is with the rod at a 45 degree angle.